Suvi Naturals brands itself as a leader in botanical skincare, claiming to use the best natural ingredients. 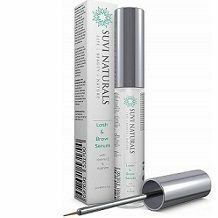 We review the company’s Lash & Brow Serum because Suvi Naturals says it will give you longer, fuller lashes, and thicker, more defined eyebrows. The company says it has packed its products with antioxidants so you are able to defy the signs of aging more easily, and that all its formulations are suitable for dry, oily and combination skin. Suvi uses a formula which seems to be popular and very similar to another product we have looked at. Vitamin E is a critical component in the fight against aging. It seeks out and destroys free radicals so that your cells are protected from damage. Assisting in this antiaging fight is Coenzyme Q10. Panthenol, or vitamin B5, soothes, rejuvenates and is immensely hydrating. It, too, is present in the ingredient list. That said, there are a few well-researched components missing. Marula oil is one of them. The anti-aging benefits of this oil are so potent and so many, that it is being called a ‘miracle’ oil and elixir of life. Resveratrol, the same anti-aging compound found in dark chocolate and red wine, is also not included. As with marula oil, its benefits cannot be overstated. After washing and drying your face, apply the serum to the base of your eyelashes and eyebrows. Use it once a day. The manufacturer predicts that you should see results within two weeks. The product is not available to buy on the manufacturer’s website and you have to do so via Amazon. You’ll pay $19.99 for the wand. You’ll save 15% if you buy 4 wands. Suvi is one of the few manufacturers offering a discount for multiple, one-off purchases of the same cosmetic product. If you’re not happy with the product, you are free to contact the manufacturer within 30 days for a refund. It is likely you will have to pay the shipping although this isn’t stated. Given the manufacturer’s stated confidence in their product, we did expect a longer return period of 60 days or more as offered elsewhere. Besides being cruelty-free, Suvi Naturals is also GMP certified. Not many cosmetic manufacturers are, and this means you can be assured of superior quality control in the manufacturing process. There is also a great likelihood that what you are putting onto your skin is as indicated on the label, and not a generic cream with emulsifiers, for example. However, the proof of the pudding is in the tasting – and, in this case, regarding results, Suvi gets lukewarm reviews for this serum. Some consumer feedback, unfortunately, is that the serum seeps into your eyes despite following application procedures, causing eye residue. Our concern is also with the formula because there is no sign of two supremely hard-working, clinically proven ingredients: Marula oil and resveratrol. This does tend to indicate that the effectiveness of the formula is rather compromised, especially if you are looking for long-term results.